He was born in Patra in 1978. He holds a Bachelor and an M.Sc. Degree in Banking and Financial Management from the Department of Banking and Financial Management of the University of Piraeus. He joined Alpha Bank in 2000 and has served in Credit, Corporate and NPL Divisions. 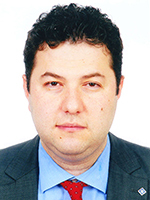 He was Manager of the Wholesale NPL Division from January 2011 until November 2014, when he was appointed Executive General Manager of the Bank.